If you are reading this, then it means that you are currently losing money and you are looking for a solution to stop that. We can’t promise you that after you read this article your revenue will increase 1000 times or that you’ll be closing deals as fast as Usain Bolt's top speed, but this is a good starting point and I hope that you’ll learn something new today. To be honest, closing more deals is every company’s problem at some point in their evolution and automatically this transcends to every founder, Sales Manager, Business Development Manager (BDM) or Business Development Representative (BDR). In “From Impossible to Inevitable”, Jason Lemkin calls this “the Founder hell year”. We hit that wall a few times in the past and along the way we managed to exceed some learning curves and find some suitable solutions. In order to solve this problem and to help others, we translated the lessons we’ve learned into a sales canvas. With that being said, let’s get a little bit into more details and slice the process. In our first sales for startups article we’ve learned about sales funnels and conversion rates. Remember that sales is a numbers game and you need to contact a lot of prospects to achieve that 7% conversion rate or more. That’s why you need to analyse the conversion rate from one stage of the sales funnel to another and see how you can increase those conversions. Please note that the reply rate will always be small, but based on my experience, if it’s below 24% then it means that you have a problem and you either need to adapt your subject line/your message or you are not addressing the right personas. Beside that, you should also analyse the time spent on each channel you are using for a cold approach and see what is the conversion rate of it. If you are spending too much time on one channel and you got the fewest leads from it on your entire sales process, then you might consider giving up on it and focusing your energy on the channel that brings you more leads. If you want to go deeper than that, you can always check out what is your average deal or best package sold and see how can you take advantage of that. Maybe you can raise the price of that specific package, or who knows what other idea may come into your mind. Sometimes the problems appear when we do not have all the information that we need about the client. Maybe he/she needs some approvals from other colleagues/superiors or maybe your solution doesn’t solve his/her problem. That’s why it’s important to do a virtual close and find out as much as you can about the person that is on the other line. You can find more about that by reading this great article written by Steli Efti. This is also a trick to make an estimation about the length of the sales cycle and the resources you have to invest in closing the deal. Sometimes we forget about our existing clients and the fact that maybe some of our other solutions could also be helpful to them. For example, in our case, if a client wants to build a web platform, maybe he will also need a mobile app in the future and we can help him with that. This process is known as cross-selling. In case that we have a past client and he is planning to add some features to his platform in the future, we can make a proposal for that too. This is known as an up-selling process. Adding these 2 small techniques to your sales process will definitely increase your revenue. What does this mean? Well, you should listen to his needs and act accordingly. You should be honest and tell him if you can or can not solve his problem. Beside that, you should always ask for feedback, after you make a proposal, give a price estimation, even when the client turns you down. You need to know why he made that decision and find a way to avoid doing the same thing in future proposals. Also, when you are asking for feedback you should include some improvement points and suggestions for your product and the way you communicate as well. Usually your lead will tell you something like you are not a good fit for them or they are not there yet to use your product/to buy your services. But you need to dig deeper into that and find out the root cause for their refusal, without being too pushy. Your solution can’t solve every specific problem of your client, and it’s normal for some of your leads to turn you down. You should get used to that and turn the negative answer into an advantage for you. Maybe your solution is not suitable for that specific client but that shouldn’t stop you to ask for a referral. What if he knows somebody that could benefit from your product/services? Okay, this was the last step from our canvas. Now it’s time to bring back our good old friend from the meeting appointments software and do an example. You are analyzing your conversion rate and you see that it’s decreasing from prospect to opportunities. You dig a little bit deeper and you also see that your open rate is 30%. This means that your subject line isn’t so great, and you need to change it. As for the channel, you notice that it takes a lot of time for a prospect to answer you on LinkedIn, and a lot of follow-ups from your side to get an answer. Beside that, the deals from this channel are the fewest. That’s why you decide to cut out this one and focus your energy more on cold emailing. When it comes to the most sold plan, you notice that it’s the Pro one, and your next step is to increase your price on this one by 10% for the clients. Taking this a step further on your first call with an opportunity, you also find that in the process there are 2 more departments involved, and you should wait for their approval, if they decide to choose your solution. This means that the sales cycle will take a bit more than usual. You are also talking with some of the existing clients, and you propose to some of them to have Premium support (cross-selling), and to the others to upgrade their plan to a higher one (up-selling). Now you have done an up-selling and a cross-selling. When asking for feedback from your leads that are willing to buy your single plan, you discover that the price is too high. So, the next step is to do a brainstorming about what’s the value that they gain by using your product. By doing this last step you manage to complete the canvas and find some bugs in your sales process. In case you want the pdf version of the example above, you can download it here. 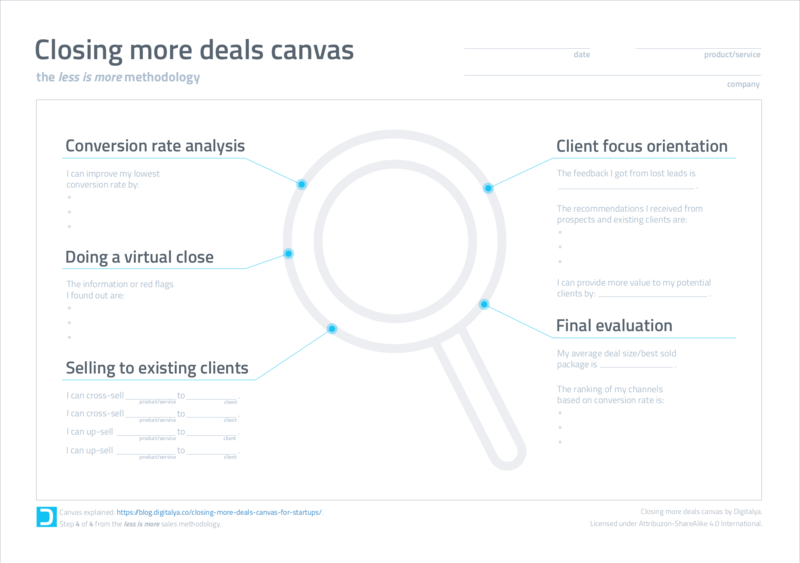 deals canvas Sales for startups.